Many coffee lovers believe that a French Press is the ultimate way to brew coffee – it allows the coffee’s natural oils to make it into your cup and pulls in a fuller flavour. However, a poor French Press can leave you with a bad taste in your mouth, quite literally. Take a look at this selection of the 9 best French Presses in 2019, including both steel and glass presses to help you make delicious coffee at home. Using a good French Press is easy, but finding one is not. The internet is filled with French Presses that don’t filter properly or don’t retain heat. We have compared a huge number of French Presses and filtered them down to a list of 9 to help you find the right one to suit your budget, style, and preferences. If you’re not sure what to look for in a French Press, just take a look at our buying guide, below the reviews. 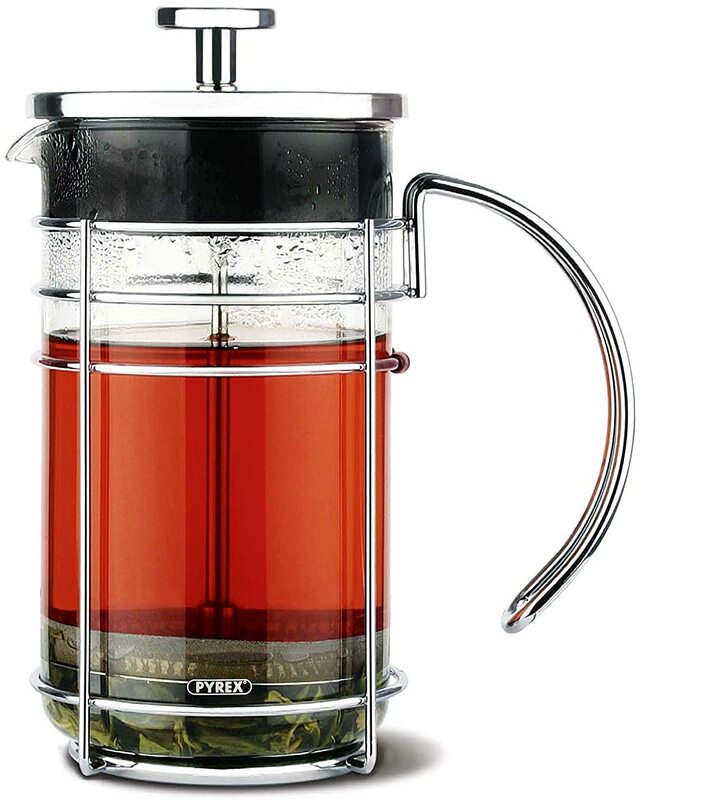 This stylish French Press offers excellent filtration, a comfortable handle, and beautiful looks. The designers clearly wanted the purest coffee, and even added a spring-loaded seal to the filter to make sure that no residue gets though when you plunge. It comes with a lifetime warranty that covers both breakage and damage, so you have an excellent, stylish filter that delivers excellent coffee. The biggest and probably only issue with this French Press is that the plunger is plastic. It explains why you can get such a great looking press for so little, but ultimately it still works well. Some people have also stated that they had a poor product arrive – while this isn’t true of the majority, it does show that quality control might be lacking. The Bodum Chambord is a very classic French Press. The entire press is dishwasher safe, it has a great design, and an extra layer of filtration to prevent residue from finding its way into your coffee. While the entire press works well when new, the handle has a design flaw where it relies on the tension of the metal around it to stay fixed. Unfortunately, this can warp over time and there are no screws to stick it back to the press. This only happens to a minority of presses but is an issue with this model. The carafe is removable and easy to wash clean, and most users report that they have no problems with either the glass or warping. The price is a little higher than usual for a glass French Press, but the quality and purity of coffee that you get is certainly worth paying more for. If you’re willing to spend a little more on your French Press, you may end up joining the many coffee lovers who are opting for entirely streel French Presses. Metal retains heat 4x longer than glass and is not prone to breakages like glass. 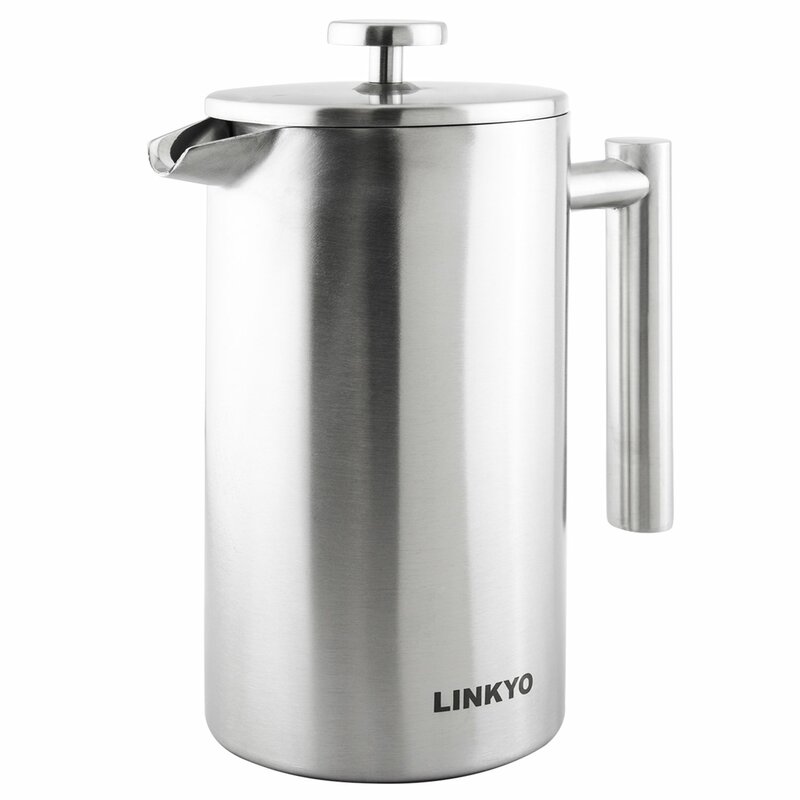 The carafe is little larger than average at 36 oz, perfect for serving guests or households with a few coffee drinkers. The handle is well designed to avoid overheating, with plenty of space for your fingers as well. 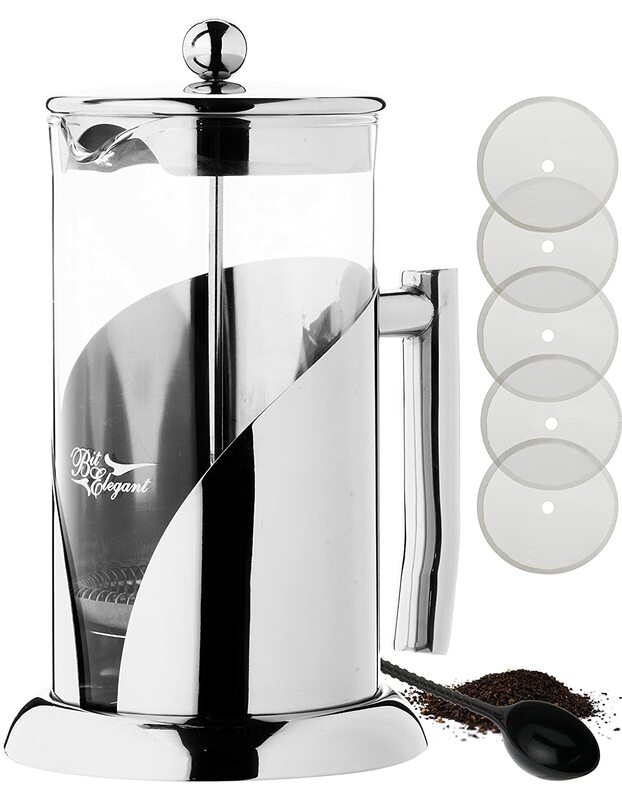 The Freiling French Press comes with a 5 year warranty, which shows the manufacturer’s confidence in it. You can choose from a mirror or brushed exterior, and both are dishwasher safe so cleaning your French Press couldn’t be easier. If you’re looking for an alternative to glass and steel, or something that looks a little quirky, Le Creuset’s Stoneware French Press may be just the thing. The stoneware keeps your coffee hot longer than glass and enamel means that it’s easy to clean (but you will need to clean parts of it by hand). This French Press is smaller than average, which is great for lone coffee drinkers or smaller households. 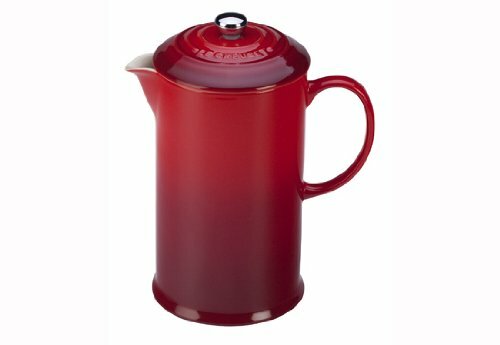 Le Creuset are renowned for excellent quality, and their French Press is no exception. This is not the best pick for people looking for a classic French Press or a household with multiple coffee drinkers. But if you don’t need to make much coffee at a time and want a French Press that looks a little different, this is the perfect solution. While the LINKYO French Press only has a 2-stage filter, they recommend using 2 filters instead of 1 (basically giving it a third stage) to improve the filtration. 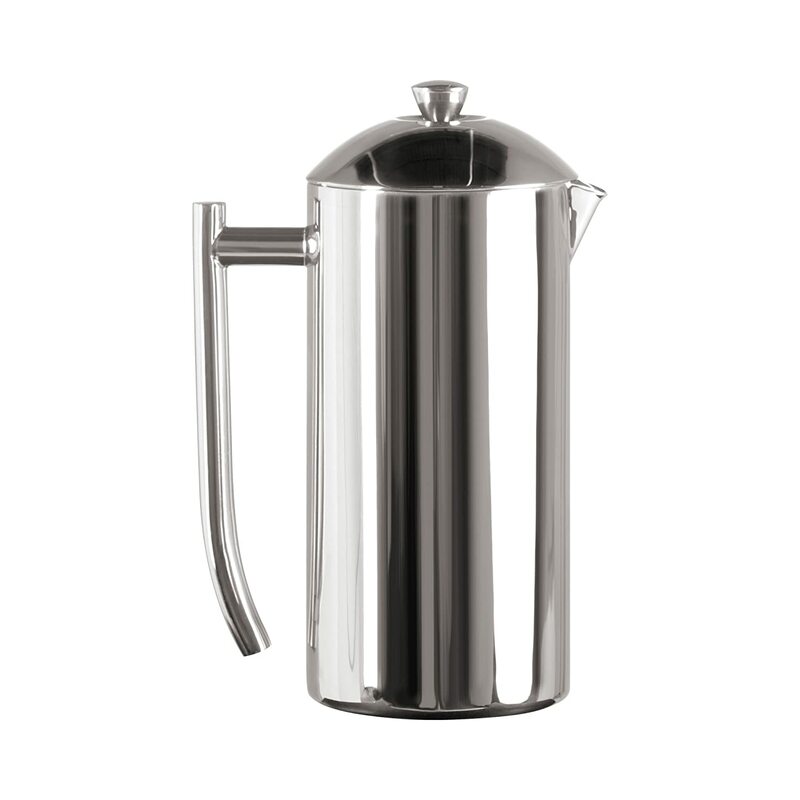 This steel French Press costs around the same as a glass one, which gives you better thermal efficiency and a more durable product. It’s fairly solid, which is to be expected when it’s made from stainless steel, and makes great coffee. When a steel press costs the same as a glass one, there is bound to be a compromise somewhere. A few LINKYO buyers have reported leaks in the air pocket between the inner and outer surfaces. This means that it won’t retain heat as well and residue might make it into that area and will not be filtered out when you plunge. Even worse, it has major hygiene implications which means that you will not be able to clean it properly if you do experience this fault. But the good news is that if it happens within 2 years of purchase, it should be covered by the warranty and you will be able to get a replacement. It’s a great-looking French Press that works beautifully, but appears to have a short lifespan. 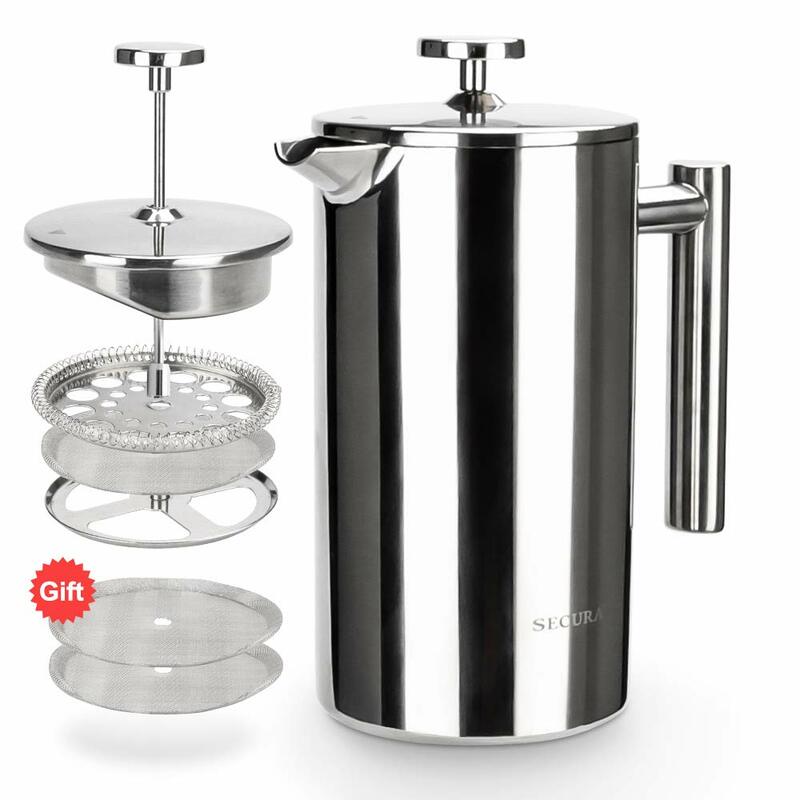 Every part of this stainless steel French Press are dishwasher safe. It has two walls to ensure that your coffee stays hot for as long as possible, and a 3-layer filter to make sure that you don’t get any residue in your cup. It’s an excellent French Press and the main drawbacks come from excessive marketing claims rather than the product itself. The main issue is that Secura and resellers have claimed that the carafe’s technology can keep coffee hot for far longer than it actually can (and should). 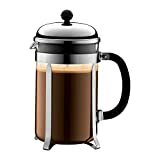 A French Press is not a thermos, and coffee should not be kept in the press for longer than the brewing time since it will lead to over-extracted and bitter coffee. While the French Press will keep your coffee piping hot, it is not actually capable of keeping your coffee hot for an hour. It’s probably best not to taste coffee that has been brewing for an hour either. If you don’t entire believe the hype and use the French Press as intended, it’s an excellent product and a great choice for any coffee lover. 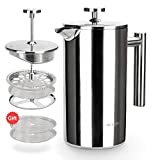 Like the Cafe Du Chateau French Press, the BitElegant has a steel case around a glass carafe, which helps to keep the coffee hot for longer than just a glass carafe with a steel skeleton around it. 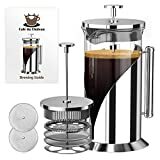 Its sleek and elegant design looks more modern than most glass French Presses, and overall it is well made – there is no plastic anywhere, including the plunger, and it comes with a lifetime warranty. The handle is far enough from the body of the French Press to make sure that pouring is comfortable, but the spout’s design does mean that you inevitably have a drop the slides down the front of the press and onto your table. Overall though, it’s a great design and a well-made French Press. It’s easy to use, maintain, and the filtration is good for a press that has 2 steps rather than 3 or 4. If you’d like to buy from a company with good corporate social responsibility, GROSCHE is a great choice. The GROSHCE safe water project uses profits from their sales to provide safe drinking water to communities in need. Their bio-sand filters have provided 45,200,974 days of safe water for communities around the world (at the time of writing this). The filters are even made locally to provide jobs. But onto the French Press – it has a classic design and it’s very easy to clean either by hand or in the dishwasher. However, there are a few areas where the quality isn’t as great as some other French Presses within the same price bracket – one of the filters is plastic, which will inevitably mean that you need to replace it sooner. Plastic also absorbs more flavours (especially when hot) so it’s not great for brewing different drinks in your French Press. The glass carafe is also a little thin compared to similar French Presses, so despite the warranty it may not last as long and definitely does not retain heat as well as some others on this list. Overall, it’s a good choice if you like to buy responsibly and makes good coffee, but may not be a ‘buy once’ French Press. If you have a household of coffee lovers or entertain a lot, you probably want a larger coffee press to make sure that you have enough to go around. 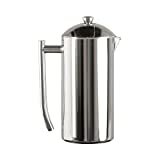 This is the largest French Press on the list, and should offer enough for a large family or small dinner party. The only problem is if you expect to fit 50oz into the carafe – the measurement is slightly off or rounded up by the marketing team. Pouring 48 oz into the French Press will fill it completely and you wouldn’t to press the plunger with that amount in. It’s still considerably larger than the average press and makes plenty of coffee, but is not quite as big as advertised. However, it is well made with no plastic parts and an extra filter for purer coffee and less risk of residue getting through when you plunge. 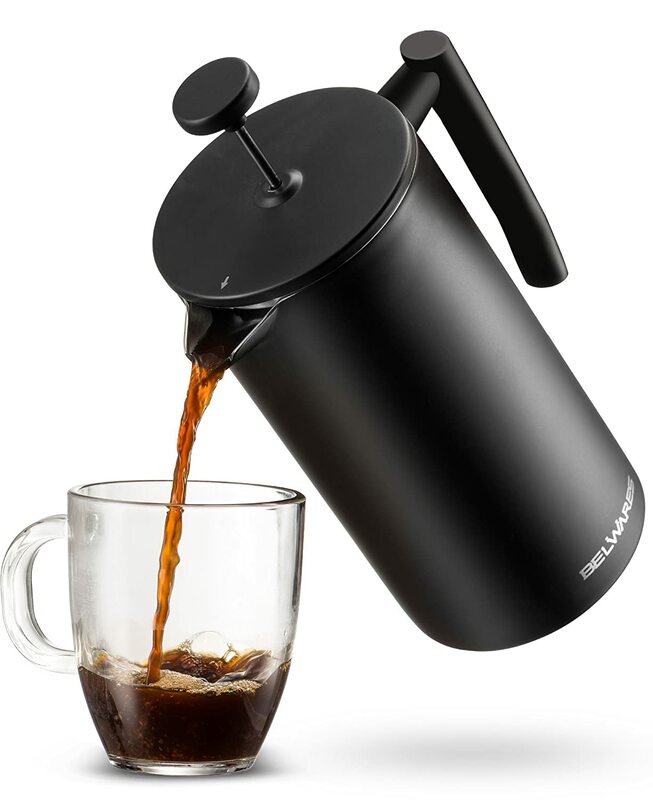 It’s extremely easy to clean as it is dishwasher safe, and the stainless steel carafe keeps your coffee hot for longer. All in all, an excellent French Press if you’re happy to settle for a carafe that is slightly smaller than you may expect when you buy. A French Press is an elegant way of making coffee – simple in both design and process. You boil water, pour it over your coffee grounds, wait a few minutes, and then press. Coffee made this way has a fuller flavour than filtered coffee, with oil from the beans on the surface and everything but the grounds makes its way into the cup. It’s the dirty martini of coffees. Steeping means that you get far more complex flavors and a smoother taste – many aficionados say that this is the way coffee was meant to be made. While the process is simple, it’s important you have the right tools for the job. Using a grinder at home instead of buying grounds means that you’ll get a fuller flavour, better aroma, and will be able to get more of the oils from your coffee beans into your cup. Oils evaporate extremely quickly so it’s best to make your coffee within 30 mins of grinding the beans. How many coffee drinkers are in the household? Coffee continues to brew even after you’ve pressed it, so it’s important that you only make as much coffee as you’ll drink straight away. If you buy a large French Press and leave coffee in it before returning for a second cup, it will be over-extracted and bitter. However, you can always pour the excess into a carafe or thermos for later. Do you prefer steel or glass? Most French Presses are made either from metal or glass. Glass is more traditional but also more fragile. Steel French Presses last longer simply because they won’t break if dropped, and the carafe keeps your coffee hot for longer. However, steel does affect the taste of your coffee – some coffee lovers enjoy the taste but purists often opt for glass so that they only get the pure taste of their chosen coffee beans and roast. Steel is also typically more expensive, but has a longer life. Plastic is also an option but it does not work well with hot water and is not good for either flavor or hygiene, which is why no plastic French Presses have been included in the list above. French Presses typically have a 2-stage filter – one part is a steel skeleton, which provides the structure for the press and deals with most of the coffee grounds, and the second part is a finer mesh that prevents stray grounds from making their way into your cup. Others like the Café Du Chateau French Press and the Bodum Chambord French Press have more layers to extract the purest possible flavor. The main benefit of the additional filter layers is that they pay more attention to the edges of the press, which is where the majority of residue gets through. Do you need your French Press to be dishwasher safe? French Presses are very easy to clean and maintain, but not all are dishwasher safe. If it’s important to you that it can be washed in a dishwasher, be sure to check before buying.